They all landed on the wrong side of California's "three strikes and you're out" law. One wound up in prison for 50 years to life for twice shoplifting videotapes from Kmart. Two others - one convicted of stealing a $25 steering wheel alarm, the other for shoplifting $43 worth of videotapes - were sent away for 25 years to life. But in two decisions just months apart, the U.S. Ninth Circuit Court of Appeals ruled recently that all three prison sentences - despite the defendants' prior criminal records - amount to cruel and unusual punishment. Even the violent prior offenses in two of the cases did not justify 25 years to life in prison for petty theft, the court concluded in February. "This is a big green light for challenging excessive sentences for minor offenses that are being sentenced under the three strikes law," said Loyola law professor Laurie Levenson. 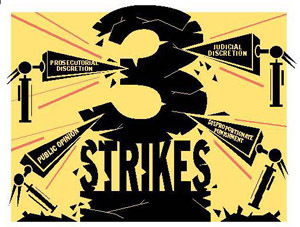 The opinions - the first issued in November, the second in February - thrust the three strikes law back into the public spotlight, reignited debate, prompted hundreds of hopeful prisoners to contact attorneys and gave momentum to campaigns seeking to narrow the law's net. Whither the Conference of Delegates? Despite a prickly relationship in recent years, the State Bar and its sometimes controversial Conference of Delegates have begun taking friendly steps toward resolving their differences, moves that may well lead to a separation. Following a meeting at which both sides were surprised to find they agreed that something has to change, the conference is trying to create a series of proposals or models by the end of this month. In an effort to more effectively meet the expectations of the public, its members, other justice system partners, and other branches of government, the State Bar Board of Governors recently adopted an interim strategic plan to help it operate better. It approved goals and strategies for dealing with six long-range issues: admission, regulation and discipline; member services; equal access to justice; stakeholder relations; leadership and accountability; and technology. The board hopes that an ongoing strategic planning process will help it meet its public service goals and responsibilities. It will review the strategic plan at its May meeting. The strategic plan is an outgrowth of a movement toward better governance and planning which began in October 2000, when the board voted as its top priority to review its governance structure and to develop a strategic plan and planning process. The following year, the state auditor pointed to the need for more strategic planning, a need the chief justice and Administrative Office of the Courts also have suggested. The full text of the strategic plan can be found on the bar's web site, www.calbar.org. The State Bar has asked the Supreme Court to allow it access to suppressed evidence in the case of a Sacramento attorney the bar is investigating for possible discipline even though criminal charges against him were dismissed. In an unusual petition in which the bar is bypassing the court of appeal, its lawyers said a Sacramento Superior Court ruling that they could not use illegally obtained evidence impairs the bar's ability to discipline its members and in turn undermines the Supreme Court's authority to regulate the practice of law. The bar went directly to the high court because it holds that authority.